“It is with deep regret that I need to inform you…” Tears well in my eyes. The email from the landlord/rental agent confirms my absolute worst nightmare since being sick with a chronic illness. I have to move. AGAIN! This will be the fourth time since getting sick that I need to move. Yes, moving is a normal life event. I get it, it happens. But when you have a chronic illness this process and the emotional, mental and physical toll it takes on you cannot be comprehended. The last time I moved it took months. Yes, months for my body to recover. Why the toll? Well there is the physical toll of course…you have to pack things, sort things, move things, collect things, go to open houses and arrange inspections. And clean! So much cleaning! (Something I would normally avoid on a good day at the best of times!) Then there is the cognitive toll, the planning, the lists, the trawling of the real estate sites, the copious amounts of information that needs to be entered into applications, organising moving trucks, redirecting mail and making calls to change the utilities. Then there is the mental check list that goes around and around and around your head. Each time I awoke last night a mental checklist of all the things that needed to be done whirled around and around my head. This cognitive exertion is as bad and even worse at times than the physical. Then the emotional. The stress. Will it get done? How is my body going to cope? And the guilt…can I possibly ask that person to help…Again?!? All of this is running around my head at the moment because last week I received that email. And so next week, we are moving. It has been less than 2 weeks since I received that email, and already my body has had enough. Despite my best efforts to limit steps, and pass on responsibilities, this body of mine has crashed, and I have spent the day moving from bed to couch...my brain so fried that I could not even follow an episode of Scandal. 1. DON'T! Avoid moving at all costs! 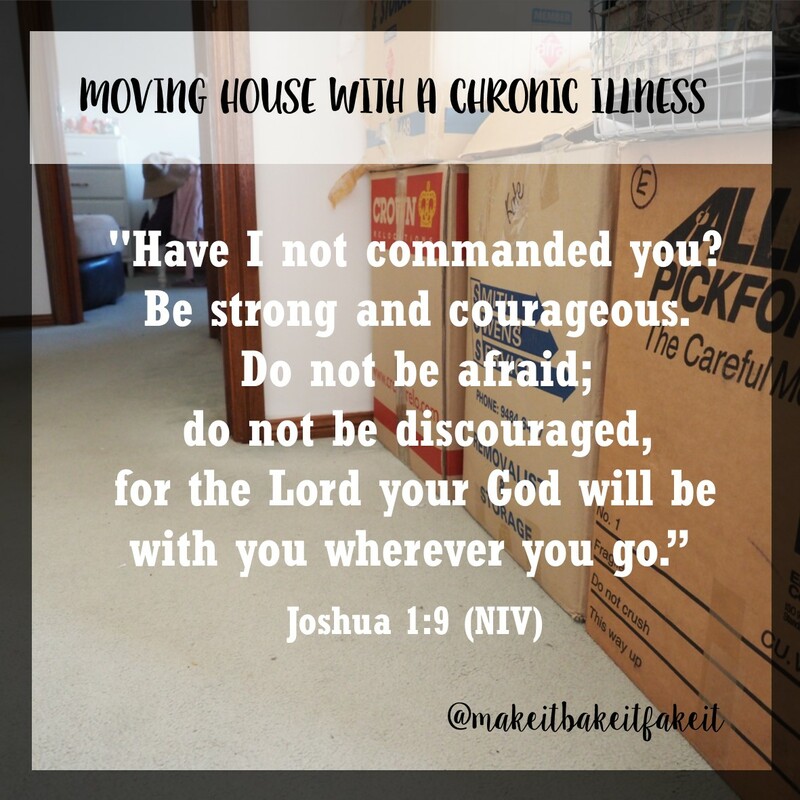 However, as for most people, the onset of a chronic illness means a dramatic change in financial status, ability to self care and increasing medical expenses and requirements, so moving is inevitable...whether that be finding somewhere cheaper to live, back in with family, or closer to medical services. In the 4 years I have had chronic fatigue syndrome I have moved 4 times. Four times of packing up a whole house and moving. So, as the moving process is probably inevitable…keep reading below. Aim for packing one box a day. If you have the energy, aim for two. Focus on the messy personal areas…bedroom, office, where you can cull and sort at the same time. Save the kitchen, the DVD collection, the bookshelves etc for friends and family who offer to help. And if they don’t offer to help, host a packing party…order pizza, tell your friends you need the help and direct them to the kitchen. Write a few good to-do lists for moving administration, packing and cleaning. That way, you have the satisfaction of striking things off a list, you can also clear the muddled millions of to-do actions running around your head. It is also handy for when you have others help you, they can check what needs doing and just do it, with out needing to bother you with needless questions. I am thankful I have a bunch of friends who have muscles…one reason to stay in contact with the fitness mad friends I used to exercise with! I am also thankful that I am a part of a caring Christian church community, where people help each other move all the time, and don’t think twice about it. I always feel guilty to ask. But am thankful for people around me who just offer. It is also a challenge to not feel offended when people cannot help. Many people are busy and have many commitments, some may not be able to help on moving day, but may offer meals, packing help, cleaning or unpacking assistance. Sometimes it is hard to find a strong support network, especially when living a life of chronic illness which is very isolating. Don't be afraid to reach out to community organisations, friends or family to see if they can help, or point you in the direction of someone who can. These tubs are not much more than the cost of moving boxes...but they can be easily accessed and can store all the things you don't use regularly...and they are ready to go for next time you need to move. Write clearly on the sides so that they can be stored in a garage or shed and quickly located when required. I have found that in the time I have been unwell I have also left two teaching jobs, and so I have loads of teaching resources I have not had the time or the energy to sort yet, and so they are sitting in tubs waiting patiently for the day I return to work. At least with the tubs, they are waterproof and easy to pick up and move to the next location. Whilst on this topic of waterproofing…I have had multiple garages flood on me…so plastic is best! Also add some damp rid products in the area where you are storing to draw away moisture, and raise things up on bricks. 5. Escape on moving day. Run far, far away...which I know has probably been your aim since the moment you heard you were needing to move...anything to escape this nightmare. However, truly there are some things you need to let go and let others deal with. I find this so hard! This is my aim for our next moving day. I have stated it already. Whether I am able to let go and not hold onto the control I so naturally hold, will be another issue. But that is the aim. If disappearing is not possible, develop clear contingency plans. Have a chair ready to sit on at the new location. Stick up Post-It notes where you want certain items of furniture to go. Have all your bedding ready to go and be made up on your bed as one of the first priorities. Don't be afraid to walk away and take time out. Drink lots of water. Pack your medications to stay with you on the day. Have plenty of snacks available. Moving house is not easy...on so many levels. All the best...my thoughts (and prayers) are with you wherever you are going through this. If you are reading this and don't have a chronic illness, I hope that this will encourage you to support and have a deeper understanding of how something like moving so deeply impacts those you know with a chronic illness. Today has been one of those days. One of those days when the reality of life with a chronic illness rears it's ugly head. When even the clues right in front of you just don't add up. The day started well enough. I even showered. Double win! I was ready to face the day. Well, so I thought. Up to the local shops I went. Petrol was still cheap, so I filled up. There were just a few things on my shopping list...it was achievable. Well. It should have been. I had just had 3 glorious days filled with fun and adventure over the weekend. And then I had spent yesterday recovering, in my pjs all day, watching Scandal and doing a puzzle. On paper, today should have been a shoe in. No questions asked. 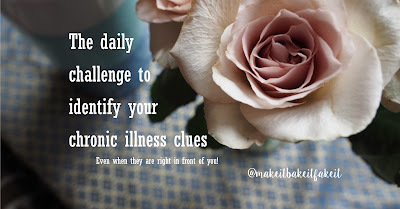 But hey, I have a chronic illness and sometimes I miss the clues right in front of me. I arrived at the local shops to find parking. All the disabled spots were gone. I inwardly cringed. "It would have been nice to be able to get one of them," I unusually thought. There was clue number 1. Ok, logistics, I need to hit up the pharmacy. The discount pharmacy is up the hill 200m or so. I might instead just go to the more expensive one inside the shopping complex. Clue number 2. I pick out some flowers, and head into the fruit and vegetable store. I grab the first items that come to me, not stopping to weigh up the cost. Clue number 3. The daze has come over me by the time I have finished at the fruit shop. I struggle to have a conversation with the cashier. Clue number 4. I wander up to the supermarket. Only 3 things on my list. I wander aimlessly up and down the aisles trying to find those items. I have to go back and do the first aisle a second time to find the item I was looking for. Finally I find it. I walk out with two of the items not bothering to make a substitution for the third. Clue number 5. My eyes are beginning to burn. I feel like I could close them for a very long time. Just one last stop. The pharmacy for the tape for my now dodgy thumb that just keeps popping in and out of place. I should probably go to the doctor/physio/chiro for it, but I am so over needing to explain new and random symptoms my body keeps doing. Instead for the moment tape will do. By this stage my eyes are beginning to water. My mind is a fuzzy mess. Clue number 6. I stop at the coffee shop for my usual coffee. I stare and pause for what seems like forever at the cashier when she asks whether I want sugar. By this point I don't even want a coffee. Clue number 7. I balance coffee in one hand, trolley with the other, wishing the hundred metres between me and the car would disappear. Or I would run into someone who would just take my groceries over to my car. I walk over half leaning/half holding on for dear life to the trolley. Clue number 8. I collapse into the car. Groceries are in, trolley is returned to the bay. I just want to sit with my eyes closed for a moment. A car is waiting to take my parking spot. I reluctantly leave. A moment more I silently beg. Clue number 9. I drive, constantly second guessing myself, as I wind through the back streets to make it back onto the main road. Praying that God would protect me on the drive home. Clue number 10. I make it back home. The groceries are left in a lingering trail somewhere between the car and the kitchen. My coffee is left half abandoned on the bench. Clue number 11. To abandon coffee...that's saying something. I collapse in bed. Spent. In tears. Clue number 12. As I lie in bed, nauseous, in pain, with burning eyes and a foggy brain. I know I shouldn't have gone to the shops today. But somehow, it's not until the clues of this disease and the symptom upon symptom build up that you can actually tell what your body is doing. Sometimes, it is just so not what it seems or what you expect. Someday's this disease just rears its ugly head....and there is not a thing you can do about it. I have an invisible illness. Yet, if I ran into you at any point today and you knew me. You would be able to see my illness. There would have been twelve clues right in front of you. Sometimes you just need to stop and look.